Ten years ago today, the world experienced an awful and tragic event – the third largest earthquake ever recorded (measuring 9.1-9.3 on the Richter scale). Ten years ago, on December 26, 2004, ca. 230,000 people lost their lives in the devastating tsunami in parts of Southeast Asia. The 2004 Indian Ocean earthquake was an undersea megathrust earthquake that occurred at 00:58:53 UTC on Sunday, 26 December 2004, with an epicentre off the west coast of Sumatra, Indonesia. The quake itself is known by the scientific community as the Sumatra–Andaman earthquake. 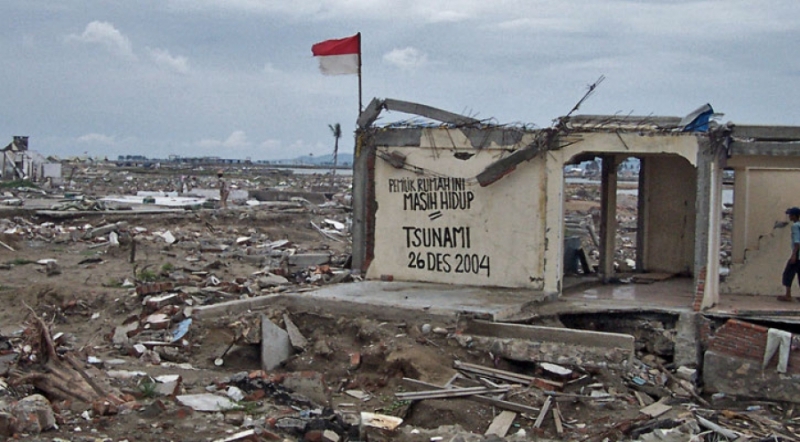 The resulting tsunami was given various names, including the 2004 Indian Ocean tsunami, South Asian tsunami, Indonesian tsunami, the Christmas tsunami and the Boxing Day tsunami. The earthquake was caused when the Indian Plate was subducted by the Burma Plate and triggered a series of devastating tsunamis along the coasts of most landmasses bordering the Indian Ocean, killing ca. 230,000 people in 14 countries, and inundating coastal communities with waves up to 30 metres high. It was one of the deadliest natural disasters in recorded history. Indonesia was the hardest-hit country, followed by Sri Lanka, India, and Thailand.